Argentina continues to improve and according to Rob McEwen: "We are getting money out from Argentina!" Listen to the conference call to get the latest information about McEwen Mining. TORONTO, ONTARIO--(Marketwired - March 10, 2014) - McEwen Mining Inc. (NYSE:MUX)(TSX:MUX) is pleased to provide a summary of the Company's Q4 2013 financial and operating results. Company reported a net loss of $11.3 million ($0.04 per share) in Q4. The loss included an$18.8 million, ($0.06 per share), net of tax write-down of exploration properties in Nevada. Excluding the write-down, the Company earned an adjusted net income of $7.5 million ($0.03per share). Earnings from mining operations* during Q4 totaled $6.5 million. Despite record production, this is down from $19.2 million in Q4 2012 and $16.3 million in Q3 2013 due to lower average realized prices for both gold and silver of $1,200/oz. and $19.45/oz., respectively. Gold equivalent production** increased to 37,167 ounces (20,686 gold ounces and 857,011 silver ounces). This is 15% higher than Q4 2012 and 2% higher than Q3 2013. Full-year production exceeded guidance by 7%, totaling 139,445 gold equivalent ounces. Production was also 33% higher than in 2012. Total cash costs and all-in sustaining costs were $751 and $1,102 per gold equivalent ounce. Total cash costs were 12% lower than Q4 2012 and consistent with Q3 2013. All-in sustaining costs were 4% higher than Q3 2013 due to increased exploration expenses and pre-development activities in order to access future mining areas. El Gallo 1 mine expansion is ahead of schedule with completion expected in early April. The estimated cost of the expansion has been reduced to $3 million from $5 million. The El Gallo 2 Environmental Impact Statement (EIS) and Change of Land Use were both approved by the Mexican government. At December 31, 2013, the Company had $25.6 million in liquid assets and no debt. During the first two months of 2014, McEwen Mining received an additional $4 million in dividends from the San Jose mine in Argentina. The majority of the dividends have been repatriated to the Company's head office in Canada. * Adjusted net income (loss) and earnings from mining operations are financial performance measures with no standardized definition under generally accepted accounting principles in the United States of America ("Non-GAAP measure"). See "Cautionary Note on Non-GAAP Measures" for additional information. ** Gold equivalent calculated by converting silver into gold using a 52:1 exchange ratio. This ratio was established on January 30, 2013 and was used to budget the Company's 2013 gold equivalent production. The silver/gold ratio does not take into account metallurgical recoveries. During Q4 2013 McEwen Mining reported a loss of $11.3 million ($0.04 per share) versus a loss of $26.3 million ($0.10 per share) in the comparable period in 2012 and net income of $3.3 million($0.01 per share) in Q3 2013. The loss during the quarter included an $18.8 million ($0.06 per share) net of tax, write-down, related to certain exploration properties in Nevada. Excluding this, the Company would have earned an adjusted net income of $7.5 million ($0.03 per share). Earnings from mining operations during the quarter totaled $6.5 million versus $19.2 million in Q4, 2012 and $16.3 million in Q3 2013. Earnings from mining operations were down despite record production due to lower average realized prices for gold and silver of $1,200/oz. and $19.45/oz., respectively. At December 31, 2013, McEwen Mining had cash and liquid assets of $25.6 million, comprised of cash totaling $24.3 million and gold and silver of $1.3 million. The Company remains debt free. In addition, McEwen Mining is owed $11.6 million from the Mexican government in the form of a tax refund. The Company believed the refund would have been received by year-end. Due to delays by the Mexican government, the Company now expects to receive all or part of the refund in Q2. Subsequent to year-end McEwen Mining received $4.0 million in dividends from the San José mine with the majority having been repatriated back to the Company's head office in Canada. 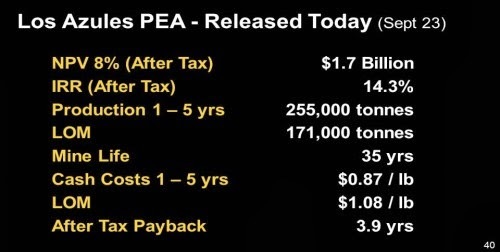 Major expenditures in Q4 included $0.7 million for the El Gallo 1 mine expansion, $2.8 million in exploration costs, $0.5 million in annual land payments and $3.1 million in general and administrative expenses. Production for McEwen Mining's share in the San José mine during Q4 2013 was 29,407 gold equivalent ounces (converting silver into gold using a 52:1 ratio), consisting of 12,999 gold ounces and 853,225 silver ounces. This was 15% higher than the comparable period in 2012 and 3% higher than Q3 2013. For the full-year San José produced 108,326 gold equivalent ounces exceeding 2013 guidance for the third consecutive year by 5%. In addition, full-year production was 10% higher than 2012. Gold equivalent total cash costs in Q4 2013 equaled $747 per ounce. This is 12% lower than Q4 2012 and 3% higher than Q3 2013. Costs fell year-over-year due to increased production and a declining Argentinian peso, and were up slightly over the previous quarter due to lower gold and silver grades processed. All-in sustaining costs totaled $1,014 per gold equivalent ounce and were 17% lower than Q4 2012 and 4% higher than Q3 2013. The movements in all-in sustaining costs are due to the change in total cash costs noted above and fluctuations in exploration, pre-development and capital expenditures from quarter-to-quarter. The average realized prices for gold and silver during Q4 2013 were $1,187 oz. and $19.44 oz., respectively. Production guidance for San José in 2014 is estimated at 97,500 gold equivalent ounces. Gold equivalent production is lower than 2013 due to a higher silver to gold ratio being used to calculate gold equivalent production (60:1 in 2014 versus 52:1 in 2013). Cash costs and all-in sustaining costs are estimated at $750 and $1,100 per gold equivalent ounce in 2014. An updated reserve and resource estimate for the San José mine is expected to be released by the end of March. * McEwen Mining holds a 49% attributable interest in the San José mine. In Q4 2013 the El Gallo 1 mine produced 7,760 gold equivalent ounces, consisting of 7,687 gold ounces and 3,786 silver ounces. In its first full-year of production the mine exceeded guidance by 14% producing 31,129 gold equivalent ounces. Total cash costs in Q4 2013 equaled $765 per gold equivalent ounce, 2% higher than Q3 2013 due to lower gold grades processed in the quarter. All-in sustaining costs totaled $1,071 per gold equivalent ounce in Q4 2013, which was 11% higher than Q3 2013 due to increased exploration drilling at the mine. The average realized prices for gold and silver during Q4 2013 were$1,270/oz. and $20.55/oz., respectively. In 2014, El Gallo 1 is forecast to produce 37,500 gold equivalent ounces (converting silver into gold using a 60:1 ratio). Total cash costs and all-in sustaining costs have been estimated at $750and $1,100 per gold equivalent ounce. El Gallo 1 is currently being expanded from 3,000 to 4,500 tonnes per day. The expansion is ahead of schedule with completion expected in early April versus late June 2014. The cost to complete the expansion has been reduced to $3 million from $5 million. The cost is lower than expected due to a large contingency that was initially included but has since been reduced. The increased capacity, combined with higher grades as mining moves deeper in the pit, is expected to increase production from 37,500 gold equivalent ounces in 2013, to 75,000 gold equivalent ounces in 2015. Cash costs and all-in sustaining costs are forecasted to fall from $750 to $575per gold equivalent ounce and $1,100 to $850 per gold equivalent ounce in 2015. * Gold recoveries are projected to reach 70% through on-going leaching. On January 21, 2014, the Company announced that the Secretariat of Environment and Natural Resources (SEMARNAT) for the State of Sinaloa, Mexico had approved McEwen Mining'sEnvironmental Impact Statement (EIS) and Change of Land Use permit for El Gallo 2. These are the major permits required before construction can proceed. El Gallo 2 is projected to produce an average of 95,000 gold equivalent ounces per year (5.2 million ounces of silver and 6,100 ounces of gold) at an approximate cash cost of $750 per gold equivalent ounce (including all pre-strip and Mexican royalties). All-in sustaining costs have been estimated at approximately $800 per gold equivalent ounce (including an estimated $5 million per year on exploration). Gold equivalent ounces have been calculated by converting silver into gold using a 60:1 exchange ratio. The Company has made a temporary decision to defer the construction of El Gallo 2 due to low silver prices. The Company believes silver prices would have to equal $25 per ounce before the rate of return would be high enough to move forward with construction. In order to prepare for a possible construction decision later this year, the Company has been evaluating possible debt financing alternatives while advancing the construction of the ball mill, which is the longest lead time item associated with the project. The ball mill is 60% complete and expected to be delivered in Q3 2014. Studies have now been completed in order to reduce the estimated capital expenditures associated with El Gallo 2. Approximately $20 million in savings is expected in the following areas: 1) reduction in leach tanks, 2) smaller process plant / refinery, 3) modular crushers, and 4) reduction in transformers. These changes are expected to have minimal impact on annual production. To date $10 million of the final construction cost has been spent. Provided the Company realizes on these projected savings and factoring in the funds that have been spent to date, approximately $150 million would be required in order to complete the mine. McEwen Mining continues to advance the Gold Bar permitting process for construction and production. Gold Bar is forecasted to produce 50,000 ounces gold per year for 8 years at a cash cost of $700 per ounce and an all-in sustaining cost of $850 per ounce. The project is located primarily on public lands managed by the Bureau of Land Management (BLM). The BLM and theNevada Division of Environmental Protection (NDEP) are the primary government agencies responsible for approving the permits that would allow the Company to begin construction. In Q4 2013, the Company submitted its Plan of Operations (PoO) for Gold Bar to the BLM. The BLM has provided the Company with its comments and the Company's responses were resubmitted at the end of February. Once accepted as complete, the PoO will serve as the basis for the National Environmental Policy Act analysis. McEwen Mining is targeting final approval by the end of Q2, 2015 in order to begin construction. In Q1 2014, McEwen Mining and its joint venture partner, Nevada Exploration Inc., completed one deep hole at the Grass Valley project located south of Barrick's Cortez mine - one of the world's largest gold operations. This hole did not contain any gold nor did it encounter the rock formation that is typically associated with large gold deposits in Nevada. Although the Company is still evaluating the results from this hole, it is not planning any additional exploration activities at this project. McEwen Mining recently completed a water geochemical sampling program around its 100% owned Keystone project, located 25 km southeast of Barrick's Cortez mine. Although higher-risk exploration, the Company believes Keystone represents an interesting untested drill target along the same geologic trend as the Cortez mine. Drilling is planned for Q2 2014. The Tonkin project has a current resource of 1.4 million gold ounces in the measured and indicated categories (32.3 million tonnes @ 1.39 gpt gold) and 0.3 million gold ounces in the inferred (8.4 million tonnes @ 1.13 gpt gold). On-going tests have been completed in order to identify an economic process alternative to extract the gold. Test results indicated that approximately 50-55% of the gold would report to a concentrate. In order to increase this percentage SGS performed sub-microscopic test work in Q4 2013 to determine the reason for the low gold recoveries. The results indicate that sulphide mineralization may have been already oxidized prior to this test work starting since the samples used to perform the test were several years old. McEwen Mining is reviewing proposals that would include fresh mineralization that would require drilling three additional holes in order to rerun the flotation tests. Metallurgical tests are currently underway to determine if there is an economic method to process the Tonkin mineralization. McEwen Mining is pleased to announce that it has strengthened its management team with the recent hiring of Nathan Stubina as Vice President - Technology. Nathan joins McEwen Mining from Byron Capital Markets where he served as a Precious and Base Metals Analyst. During his time at Bryon Capital, he was responsible for leading research initiatives in the mining and metallurgical areas. Prior to his role at Byron Capital, Nathan worked for Barrick Gold as Senior Manager - Barrick Technology Centre where he was responsible for leading a technical team. Nathan has also worked for Falconbridge Limited and Noranda Inc. He holds a Ph.D, Metallurgy and Materials Science from The University of Toronto and is a member of the Association of Professional Engineers of Ontario. Nathan is the current VP International of the CIM (Canadian Institute of Mining, Metallurgy and Petroleum) and a Past-President of MetSoc (Metallurgy and Materials Society). The goal of McEwen Mining is to qualify for the S&P 500 by creating a high growth gold/silver producer focused in the Americas. McEwen Mining's principal assets consist of the San José mine in Santa Cruz, Argentina (49% interest), the El Gallo 1 mine and El Gallo 2 project in Sinaloa, Mexico, the Gold Bar project in Nevada, USA, and the Los Azules copper project in San Juan,Argentina. As of March 10, 2014 McEwen Mining has an aggregate of 297,159,359 million shares of common stock outstanding and issuable upon the exchange of the exchangeable shares. Rob McEwen , Chairman and Chief Owner, owns 25% of the shares of the Company (assuming all outstanding Exchangeable Shares are exchanged for an equivalent amount of Common Shares). This news release has been reviewed and approved by William Faust, PE, McEwen Mining's Chief Operating Officer, who is a Qualified Person as defined by National Instrument 43-101 ("NI 43-101). El Gallo: for additional information about the El Gallo complex see the technical report titled "Resource Estimate for the El Gallo Complex, Sinaloa State, Mexico" dated August 30, 2013 with an effective date of June 30, 2013, prepared by John Read , C.P.G., and Luke Willis , P. Geo. Mr. Read and Mr. Willis are not considered independent of the Company as defined by NI 43-101.Los Azules: for additional information about the Los Azules project see the technical Report titled "Los Azules Porphyry Copper Project, San Juan Province, Argentina" with an effective date ofAugust 1, 2013, prepared by Richard Kunter , FAUSIMM, Robert Sim , PGeo, Bruce M. Davis , PHD, FAUSIMM, James K. Duff , PGeo, William L. Rose, PE, and Scott C. Elfen, PE, all of whom are qualified persons and all of whom but James K. Duff are independent of McEwen Mining, each as defined by NI 43-101. Tonkin Project: For information about the Tonkin project see the technical report titled "Technical Report on Tonkin Project" dated and with an effective date ofMay 16, 2008. The report was prepared by Alan C. Noble, P.E., Ore Reserves Engineering andRichard Gowans , Micon International, and Steven Brown (then US Gold Corporation) all of whom are qualified persons and all of whom but Mr. Brown are independent of McEwen Mining, each as defined by NI 43-101. Gold Bar: For information about the Gold Bar project see the technical report titled "NI 43-101 Technical Report on Resources and Reserves Gold Bar Project, Eureka County, Nevada" dated February 24, 2012 with an effective date of November 28, 2011, prepared by J. Pennington, C.P.G., MSc., Frank Daviess , MAusIMM, Registered SME, Eric Olin , MBA, RM-SME, MSc, Herb Osborn, P.E, Joanna Poeck , MMSA, B. Eng., Kent Hartley P.E . Mining, SME, BSc, Mike Levy, P.E, P.G, MSc., Evan Nikirk , P. E., Mark Allan Willow , M.Sc, C.E.M. and Neal Rigby , CEng, MIMMM, PhD, all of whom are qualified persons and all of whom are independent of McEwen Mining, each as defined by NI 43-101. The foregoing news release and technical reports are available under the Corporation's profile on SEDAR (www.sedar.com). There are significant risks and uncertainty associated with commencing production or changing production plans without a feasibility, pre-feasibility or scoping study. The proposed expansion to El Gallo Phase 1 has not and may not be explored, developed or analyzed in sufficient detail to complete an independent feasibility or pre-feasibility study and may ultimately be determined to lack one or more geological, engineering, legal, operating, economic, social, environmental, and other relevant factors reasonably required to serve as the basis for a final decision to complete the expansion of all or part of this project. In this report, we have provided information prepared or calculated according to U.S. GAAP, as well as provided some non-U.S. GAAP ("non-GAAP") performance measures. Because the non-GAAP performance measures do not have any standardized meaning prescribed by U.S. GAAP, they may not be comparable to similar measures presented by other companies. 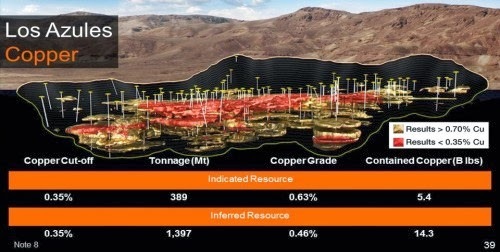 Total cash costs consist of mining, processing, on-site general and administrative costs, community and permitting costs related to current explorations, royalty costs, refining and treatment charges (for both doré and concentrate products), sales costs, export taxes and operational stripping costs. All-in sustaining cash costs consist of total cash costs (as described above), plus environmental rehabilitation costs, mine site exploration and development costs, and sustaining capital expenditures. In order to arrive at our consolidated all-in sustaining costs, we also include corporate general and administrative expenses. Depreciation is excluded from both total cash costs and all-in sustaining cash costs. Total cash cost and all-in sustaining cash cost per ounce are calculated on a co-product basis by dividing the respective proportionate share of the total cash costs and all-in sustaining cash costs for the period attributable to each metal by the ounces of each respective metal sold. We use and report these measures to provide additional information regarding operational efficiencies both on a consolidated and an individual mine basis, and believe these measures provide investors and analysts with useful information about our underlying costs of operations. A reconciliation to the nearest U.S. GAAP measure is provided inMcEwen Mining's Annual Report on Form 10-K for the year ended December 31, 2013. Adjusted net income (loss) excludes impairment charges and the related income tax recovery relating to the Company's investment in MSC, mineral property interests, and property and equipment from net income (loss). We use and report this measure because we believe it provides investors and analysts with a useful measure of the underlying operating performance of our core mining business. A reconciliation to the nearest U.S. GAAP measure is provided below. Earnings from mining operations consists of gold and silver revenues from our El Gallo 1 mine and our 49% attributable share from the San José mine, and deducts Production Costs Applicable to Sales. It also includes depreciation and amortization expense incurred at the mining operations, but does not include amortization expense related to the fair value increments on historical business acquisitions (fair value paid in excess of the carrying value of the underlying assets and liabilities assumed on the date of acquisition). We use and report this measure because we believe it provides investors and analysts with a useful measure of the underlying earnings from our mining operations. A reconciliation to the nearest U.S. GAAP measure is provided below. McEwen Mining prepares its resource estimates in accordance with standards of the Canadian Institute of Mining, Metallurgy and Petroleum referred to in Canadian National Instrument 43-101 (NI 43-101). These standards are different from the standards generally permitted in reports filed with the SEC. Under NI 43-101, McEwen Mining reports measured, indicated and inferred resources, measurements, which are generally not permitted in filings made with the SEC. The estimation of measured resources and indicated resources involve greater uncertainty as to their existence and economic feasibility than the estimation of proven and probable reserves. U.S. investors are cautioned not to assume that any part of measured or indicated resources will ever be converted into economically mineable reserves. The estimation of inferred resources involves far greater uncertainty as to their existence and economic viability than the estimation of other categories of resources. This news release contains certain forward-looking statements and information, including "forward-looking statements" within the meaning of the Private Securities Litigation Reform Act of 1995. 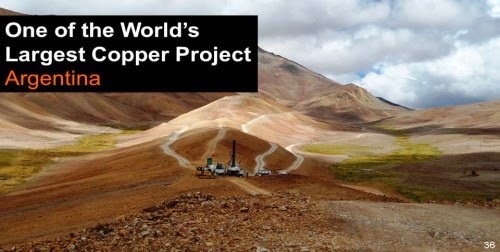 The forward-looking statements and information expressed, as at the date of this news release, McEwen Mining Inc.'s (the "Company") estimates, forecasts, projections, expectations or beliefs as to future events and results. Forward-looking statements and information are necessarily based upon a number of estimates and assumptions that, while considered reasonable by management, are inherently subject to significant business, economic and competitive uncertainties, risks and contingencies, and there can be no assurance that such statements and information will prove to be accurate. Therefore, actual results and future events could differ materially from those anticipated in such statements and information. Risks and uncertainties that could cause results or future events to differ materially from current expectations expressed or implied by the forward-looking statements and information include, but are not limited to, factors associated with fluctuations in the market price of precious metals, mining industry risks, political, economic, social and security risks associated with foreign operations, the ability of the corporation to receive or receive in a timely manner permits or other approvals required in connection with operations, risks associated with the construction of mining operations and commencement of production and the projected costs thereof, risks related to litigation, the state of the capital markets, environmental risks and hazards, uncertainty as to calculation of mineral resources and reserves and other risks. Readers should not place undue reliance on forward-looking statements or information included herein, which speak only as of the date hereof. The Company undertakes no obligation to reissue or update forward-looking statements or information as a result of new information or events after the date hereof except as may be required by law. See McEwen Mining's Annual Report on Form 10-K for the fiscal year ended December 31, 2013 and other filings with the Securities and Exchange Commission, under the caption "Risk Factors", for additional information on risks, uncertainties and other factors relating to the forward-looking statements and information regarding the Company. All forward-looking statements and information made in this news release are qualified by this cautionary statement.